Breathe in that fresh air! We have miles of trails for hiking and biking that are also perfect for those using walkers and wheelchairs or pushing a baby stroller. 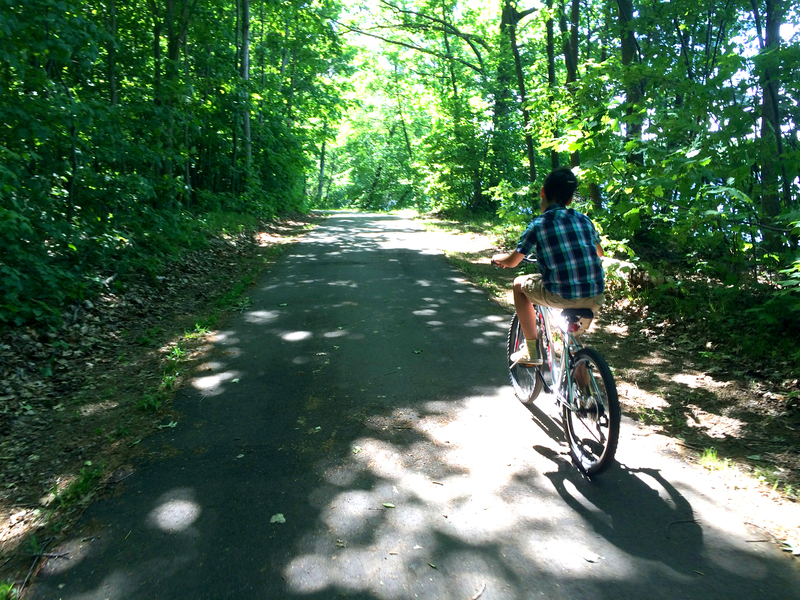 For example, Flushing County Park, just north of the City of Flushing, has 105 acres bursting with green leaved beauty and a one-mile loop of trail that connects the Park to the Flint Riverview Trail. Check out the fitness equipment here, too. Its five stations assist with 120 different exercises and can provide a good workout for nearly all 600 muscles in your body! Dogs on a six foot leash are welcome here, as they are in most of the Genesee County Parks, and at Flushing County Park, there will soon be an off-leash area for them as well. Throw a disc! Goldenrod Disc Golf Course, one of the regions’ premier courses, is just minutes from anywhere in Genesee County. This 18-basket course has scenic fairways meandering through woodlands and meadows, and players tell us they frequently spot white-tailed deer and wild turkeys. The Park has picnic tables, grills and portable toilets, so bring food and your family and make a day of it! Looking for a place where your kids can run off some steam? Richfield County Park offers creative playscapes that your children and grandchildren will love. There’s also a public bicycle motocross (BMX) track and a picturesque wooden bridge anchored by two massive stone supports built in the 1930s by members of the Works Progress Administration. Go to our Park Directory for descriptions and maps of all the Parks, and learn about the trails, picnic areas, tennis courts, ball fields and other features that make each Park so inviting. The tough part is deciding which Park you want to go to…and maybe this is the year you’ll visit all of them! Get away right away for summertime fun in your Genesee County Parks! While you’re out, share your experiences on social media and tag us or use #geneseecountyparks so everyone knows where they can join the fun.